Pressure Drops as MSL Climbs Mt. Sharp vs. Scale Height Predictions. Is the data, after documented alterations, too perfect? This article was written by Barry S. Roffman with the earlier technical help of Dr. David A. Roffman on scale height issues. Questions about it should be sent to Barrysroffman@gmail.com. Our most current prediction for the minimum pressure this Martian year is given in Table 5. Updated on 3/22/2018. This article correlates Mars Science Laboratory (MSL) pressures claimed with altitude in meters below areoid, the Martian equivalent to sea level. The data was originally published by the Rover Environmental Monitoring Station (REMS) Team, who work for JPL and NASA. They have not done a proper job of putting this data out, and may in fact be in rebellion to NASA as I write this article. This is suspected because until March 20, 2017 when the REMS Team published ludicrous data they generally went back and revised it - often after reading the critiques that are found in links from Table 1 below. We often find members of the REMS Team and their supervisors on our sites. But after March 20, 2017 the ground temperature lows became insanely cold and were not matched by very cold air temperature lows. The REMS Team ceased making changes, leaving us to guess as to what was going on. We explain this further at our article entitled HAYWIRE GROUND TEMPERATURES IN SUMMER OF MSL YEAR 3. For now let it be known that the REMS Team and NASA come here many times each week to both check on how their results are being received, and at times to see where they need to alter those results in an effort to draw less criticism. They even withdrew all their (never changing) wind data after we contacted JPL’s public relations man Guy Webster and they altered their Gale Crater Mars sunrise and sunset times to match my son David's calculations. David has applied to work for NASA several times, but so far they only choose to read everything we publish, but make no offer – probably in part because our emphasis is always on scientific accuracy rather than political correctness. The data base that we have created is superior to that put out by NASA because we show not just what they have claimed, but how they altered their data, in many cases in accordance with our nagging. We prove what we claim by in many cases publishing before and after print-screens that show what they first put out and how they altered it after reading our spreadsheets documenting their claims and our indications of anomalies in pressure and temperature. Before going any further it should be noted that we have seen the numbering of MSL years is not always the same as what we refer to in the above charts. We label the first year of MSL on Mars as Year 1, but in at least one article we have seen it was referred to as Year 0. However we all agree on the Martian sols (days). On our charts Year 1 began at landing on August 5 to 6, 2012. It lasted 669 sols (until June 24, 2014). Year 2 then began, ending on Sol 1,338 on May 11, 2016. We are currently in the fall of Year 3. As I write this article MSL, in the southern hemisphere of Mars, is in the fall season. We have at least 1,731 sols of data minus some critical data for the first 10 sols, and for a few other periods of time. The first look at data comparing some Year 3 and Year 2 is given here as Table 2. Note the small amount of variation in pressure differences. There are 14 sols shown for each year segment. Six of them show pressure differences of 11 pascals (Pa) from one year to the next. The average pressure difference was 11.57 Pa. The smallest difference was 10 Pa and the largest difference was 13. FIGURE 1 below - Map of Gale Crater with Aeolis Mons rising from the middle of the crater. The MSL landing ellipse is in the northwest corner, about 4,500 meters below areoid. The landing was under 2.5 km from the target. In MSL Year 1 for this period pressures ran from about 866 Pa up to 875 Pa. Again, that’s an increase of 9 Pa between sols 374 and 389, but I have not yet been able to find altitude contour maps from that period, so I can't yet definitively comment on how altitude and pressure were, if at all, linked for those sols. However a JPL image shows the rover locations from landing through this period, and it doesn't look like it was more than from about 910 to 1,300 meters from the landing site (about 4,500 meters below areoid). See Figure 1 above to get a feeling for altitudes at Gale Crater. Note on Figure 2 below that (due to weather), as NASA reported on March 27, 2015, the landing site had faded from view by then, two and a half years after landing. This would not likely happen if NASA was right about a near-vacuum atmosphere. The expected pressures for altitudes 4,500 meters (Year 1), 4,447 meters (Year 2) and 4,266 to 4,251 meters below areoid (Year 3) are given on Table 3. This calculation will not show the seasonal variation in pressure alleged by NASA (see Figures 3 and 4). FIGURE 2: The fading of the landing site by 2015. Note: This gif will not be included in the report. Figure 3 above: Comparison of scale heights in THE MARTIAN CLIMATE REVISITED and on a NASA web site. Table 4 shows some of how JPL/REMS altered pressures off the expected curve for August and September 2012 and August 2013 and on through at least June 22, 2017 after we either brought the deviations up to JPL Public Relations Director Guy Webster, or published on our data on davidaroffman.com and marscorrect.com websites. Those pressures that were originally above 925 Pa are shown with a yellow shading. The significance of Table 4 is that it lets us know that there is an agenda to keep pressure reported for MSL either at or below the 925 Pa indicated by the scale height calculation on Tables 3A and 3B. As can be seen from Figure 4, a maximum pressure of 925 Pa was seen in MSL Year 1 at Ls 252 and 253 (Sols 170 &171). In MSL Year 2 this same pressure was attained at Ls 257 (Sol 846). If, for the moment, we overlook the 925 pressure maximum allowed by JPL or whoever is behind the data alteration, then it should be noted that Table 2 only deals with pressures produced in MSL Year 3 between Ls 11 and 19. At Ls 11 in Year 1 the pressure given by the REMS Team was 866 Pa. This is about 92.83405% of the maximum pressure of 925 Pa (actually, 925.307 Pa) Now let's use that figure to look at what happened from Ls 11 in Year 2 to Ls 11 in Year 3. There was an increase in altitude of 181 meters and a decrease in predicted pressure of about 15.30295 Pa (Table 3A, cell H8-H9), but the actual decrease in pressure was only 11 Pa. However, if the proportional idea is correct and we take 92.83405% of the predicted drop of 15.30395 Pa, then we revise it to a predicted pressure drop of 14.206 Pa. That's quite close to the 11 Pa supposedly measured (5 sols later there was a 13 Pa decrease from Year 2). The predicted and measured differences are clearly in the same ball park, but does this mean that NASA is correct - or does it mean that the data was manufactured by someone who knew how to calculate scale height? Now, let's dig a little deeper here with the help of Figure 3. While modern textbooks like The Martian Climate Revisited use a scale height of 10.8, old sources use 11.1 and this figure is on the NASA webs site visited. The information looks old, mentioning Viking 1 and none of the landers since then in 1976. What happens if we assume that someone was tasked with predicting, i.e., manufacturing pressures for MSL based on the altitude change from MSL Year 2 to Year 3? Then the predicted pressure decrease (with Ls11 factored in) becomes only 13.67 Pa! A Pascal is only a hundredth of a millibar. 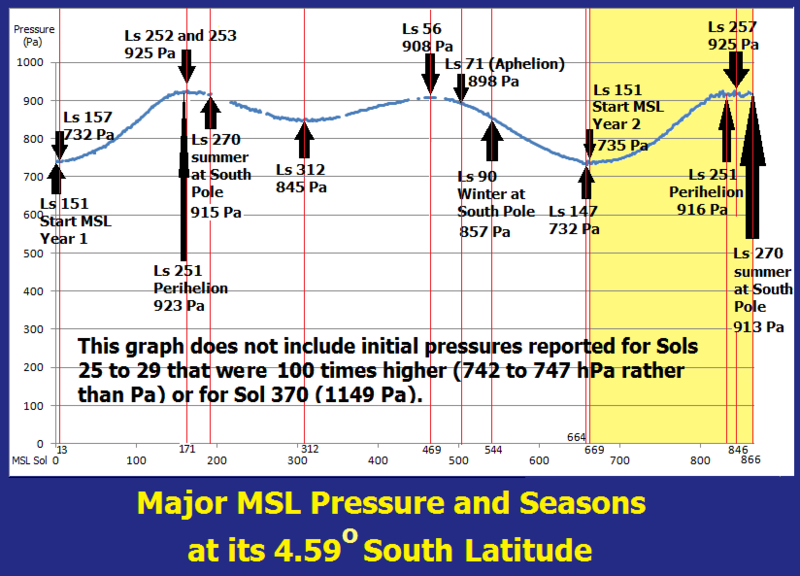 We see that on 4 sols between Ls 11 and Ls 18 the actual pressure drop from Year 2 to Year 3 was 13 Pa. Given that NASA only sent a pressure transducer that could measure up to 1150 Pa, and that, as Table 4 shows, they often reported pressures above 925 Pa, and even above 1150 Pa only to revise them down when we challenged them, there is again reason to question the reliability of the data reported. Lately NASA has returned to our site to view the CAD for the pressure transducer used on Mars Pathfinder. This CAD, shown again as Figure 6, is often visited by other space agencies too. What it shows is that two transducers were ordered by NASA for Pathfinder. One of them (Tavis - 2) was for the expected pressure range of 0 to 12 mbar (1200 Pa/0.174 PSIA). But the other transducer (Tavis -1) was designed to measure up to 1,034 mbar (103,400 Pa/15 PSIA). That's higher air pressure than is found at sea level on Earth. While we hope our audit of NASA data will lead to organizational reform rather than any kind of legal action, if it ever does go legal then the first thing we would subpoena is documentation for what happened to that sensor. Did it really stay back on Earth, or was it secretly flown to Mars? Whereas Martian weather simply does not match the low pressures advocated by NASA, and especially because NASA has for a long time visited our web sites daily, we are confident that a full investigation will reveal that are we are again quite right, and that it's time for a new announcement from NASA indicating what the true pressure is there. See Annex G of our report for further details about the Tavis transducers ordered by NASA. FIGURE 4 - Pressure curve for MSL Year 1 and beyond to LS 270. Figure 5 - Comparison of pressure readings by Viking 1, Viking 2, Mars Phoenix, and MSL. FIGURE 6 - CAD for Mars Pathfinder showing the order of two very different pressure transducers for the mission. MAJOR UPDATE OF 22 MARCH 2018. The Table 5 was taken from our sites today. It shows that on February 28, 2018 we predicted that for the current Martian year minimum pressure would be reached at about 711 to 713 Pa around Ls 148 on March 24, 2018 (MSL Sol 2002). 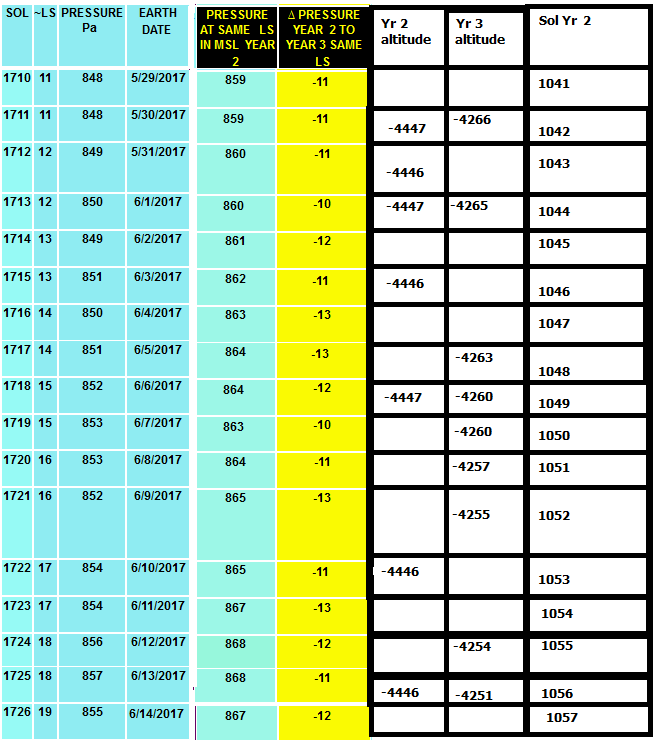 The Table shows that the pressure at Curiosity had dropped (from 727 Pa at Ls 136 on February 28, 2018) to 717 Pa at Ls 145 on March 19, 2008. Announed pressures are about 20 Pa less than the last Martian year due to an altitude increase as the lander climbs Mount Sharp. However we believe that the pressures offered by the REMS Team are false and that the real pressure is about 85 to 100 times higher. Our prediction of what the REMS Team has offered the public is based on how pressure should fall with scale height IF the average pressure on Mars is 610 Pa (6.1 mbar) at areiod.